Do you love the game Tetris but wish it was on your torso for friends and total strangers to see? Well one lucky tinkerer has a solution for you! 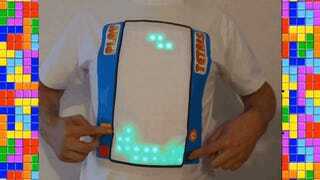 Tinkerer Mark Keger has outfitted his shirt with an Arduino Uno and 128 LEDs to create a very public and somewhat awkward wearable game of Tetris. Here's hoping you aren't ticklish.